Artist Matthew Klaas de Witte is currently starting on an exploratory project to map out new concept artwork for Human natives of Albion. Before I begin on the lore I wrote for Albion, I have to say that it is a tremendous amount of thinking going into two things I love. That is, the original Warhammer Fantasy universe, and La Tene culture. 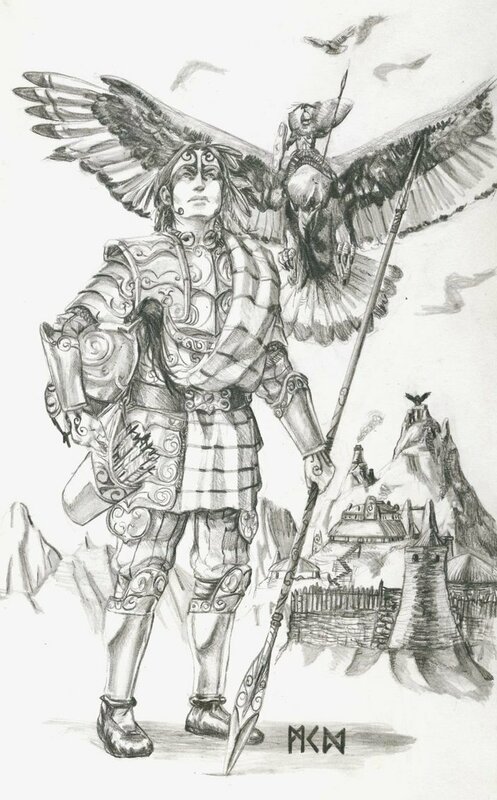 For this one I took a look at the few extant official artworks of the natives of Albion and noticed the presence of Great Eagles in the picture so I decided to make the next logical step I then formed a tribe around the eagles and their leader who is very obviously Boudicca following in the sometimes unoriginal naming footsteps of GW. Buddug is Welsh for Boudicca. Find out more in the description for each art piece on DA that will be linked-to here, and if you very much like the concept or have ideas to share, be welcome to also leave a comment below his Deviantart pieces. A sneak peek into another tribe! The Toulenii are an Order aligned Albionic tribe that occupy the oppidium of Toulenos' Roost high in the Beast Peaks of Albion. They are most associated with the Great Eagles their elite ride into battle and patrol the Beast Peaks for armies of the (now departed) Chaos demon Belakor marching South from the Citadel of Lead, of course when they are not fighting among the other tribes. 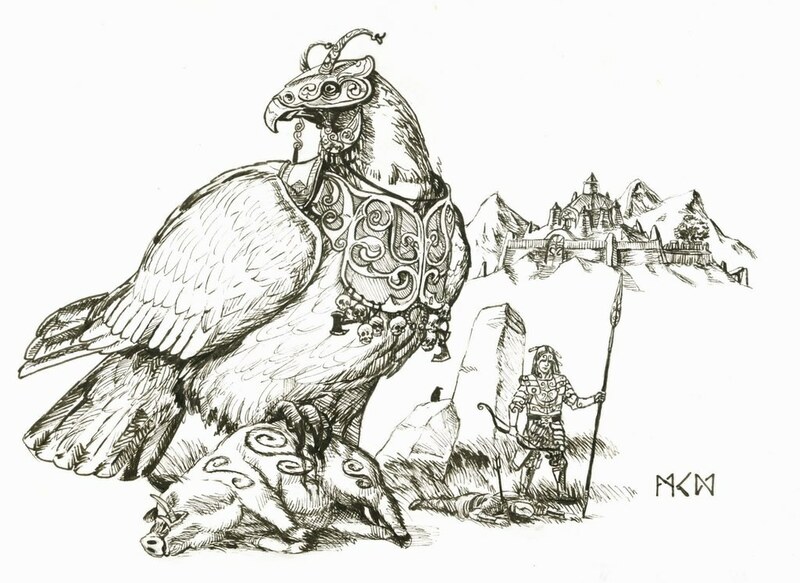 Buddug is their chieftain and rides upon the greatest of Great Eagles the Golden One: Andarta. But is sure not to stray West into the homeland of the Giants of Albion. She wields a spear steeped in magic, and fires magical arrows which are willed to their target. The fort in the background is based on a Broch. Andarta's breastplate is adorned with trophy skulls and the weapons of enemies! Vaiorix is chief of the Boreni. It utilizes its location nearby the main herding grounds of great hogs to use them as mounts. These animals have potential to grow greater in size than the ones of the Old World and Vaiorix rides one from a bloodline cultivated by the chieftains of old to be the largest and most spirited of all great hogs. 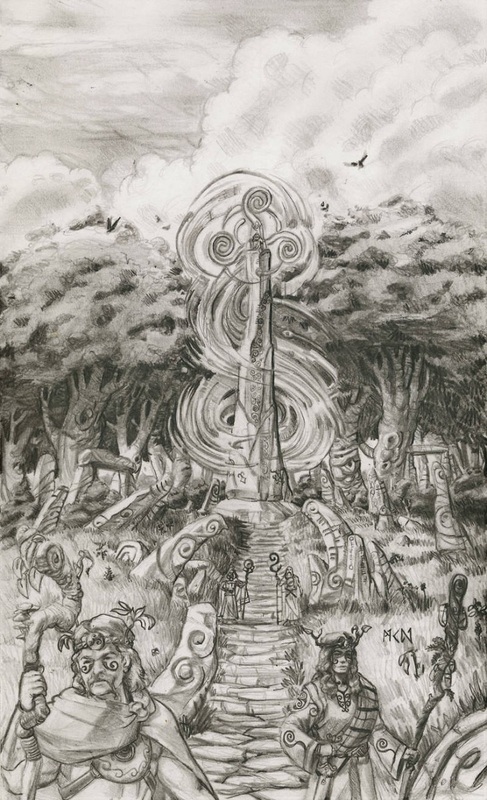 He and his tribe take the mantle of protecting the Great Ogham, The most important and largest stone circle in Albion, it channels much of the power that is used by Truthsayers. Knowledge and wisdom old and new is recorded upon its many stone edifices by the Truthsayers. He is immensely proud to a fault, he does not allow for anyone of other tribes to trespass without the blessings of the native Thruthsayers. He wields javelins imbued with the power of Light blessed by his lover; an excommunicated Truthsayer. and a magical reflective shield akin to the ones used by the elite Woad Bearer units. Said shields can reflect spells back at the offending mage. The one he uses was made in the Forge of the Old Ones, made of Old Ones forged Archbronze which is denoted by its undulating rivulets that shift as it moves. I looked to the map of Albion as inspiration for the peoples I made, using the "Great Hogs" mark and location to make a tribe and chieftain. Their location next to the marker to "Great Ogham" seemed apt to make thm protectors of this place because it seemed to be one of enough importance to write on the map. But as per usual, it is a lot of inventing on my part. Yes this is an expansion on 8th edition. I made the natives of Albion able to craft weapons and armour that could make them able to fight on the level of the other races. 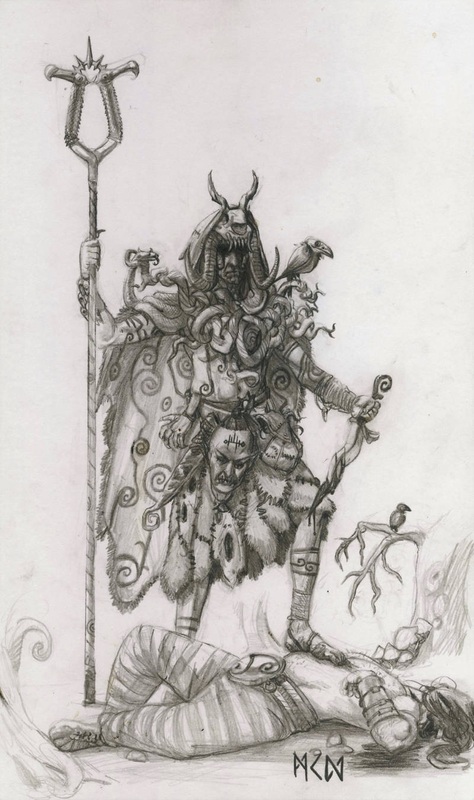 Druids were the cultural, religious, and judicial leaders of their people. So I decided to do give them the same treatment for Warhammer Albion, of course they're called "Truthsayers" in 8th edition. 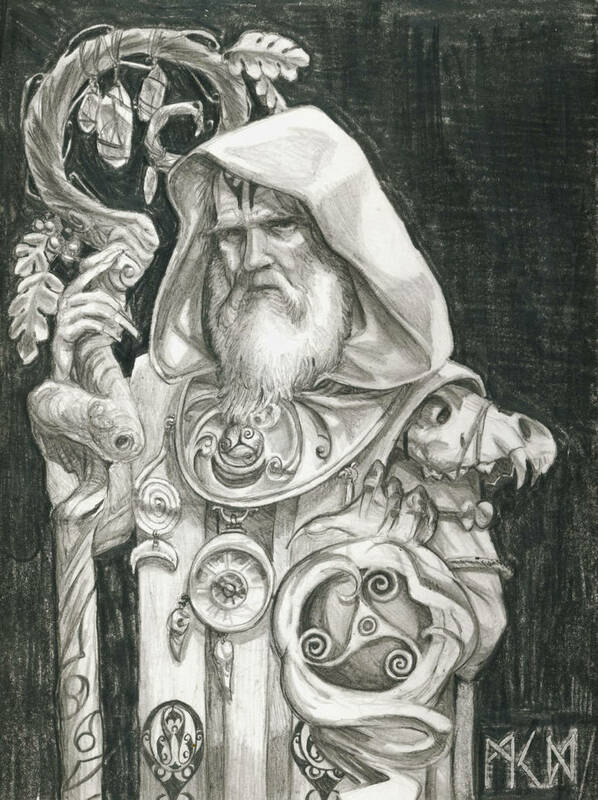 Each tribe of Albion has an assigned Turthsayer, and each of them report to the Council of Truthsayers which meet at the Pillar of Og Agog, which is subsequently headed by the being called Draoiorix, king of the Truthsayers. It sits upon its throne atop the pillar in its most relatable form, a man of advanced age. Though Draoirix is a being of unknown form or age. It is a shapeshifter. A supreme adept of the Lore of Light, Life, and Beasts. It is so old and assumed countless forms that it does not remember what its original identity was, or even if it is relevant anymore. It acts as a kind of spiritual leader and guardian of the inhabitants of the island, but belongs to no single tribe. It acts on its own accord, and goes where, when, and how it pleases. Here we see the King of the Giants facing off against Draoiorix the king of the Truthsayers, and protector of Albion. Drawing power from the ogham stones that dot the isle to cast a powerful spell likely to distract him and send him away from a human population. In truth it has no name, but is called this by the folk who have the misfortune of sharing Albion with him. 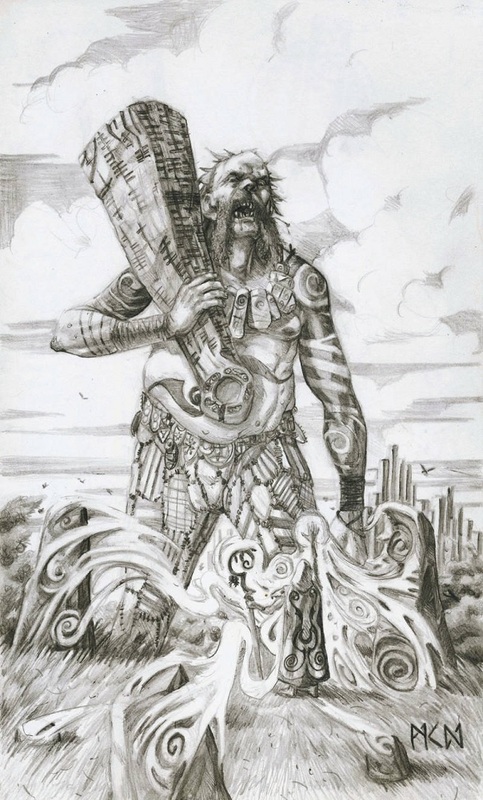 He is the height of a Bonegrinder Giant, he carries a titanic sacred ogham stone as a bludgeoning device, a magical necklace of man sized ogham stones, a tremendous moustache, and a belt of shields belonging to all the tiny-things it has crushed. An immensely powerful being, the King normally frolics among his kin in the Giant's Causeway and Beast Peaks, sticking to the mountain range in the centre-North of the Isle. Descending to gather ingredients to make intoxicating beverages, or to steal from the unfortunate inhabitants of Albion. Throwing rocks at nosey ships of the various foreign races of the world attempting to make landfall (and laughing about it) is also a favourite past-time. The King has no title to lord over his brethren, he just happens to be the biggest, meanest, and hairiest, and this holds great sway in the giant world. Also he has a big smashy stick. Draoiorix though also immensely powerful, and likely the most powerful being on the isle, does not try to subdue the giants. They are necessary to keep balance on the island, and scare away pesky invaders. But the King has a trick, it is his magical necklace of (previously) standing stones which protects him from the influences of chaos and magic spells. This does not stop him from sometimes aiding the corrupted Albion natives of Chaos that live in the North, so long as they steadily supply him and his friends with good drink. His only allegiance after all is to alcohol, and the pursuit of it. But when they run out, he adds a few more shields to his belt. With any location on the map, I have to make due with what is available, which is absolutely nothing beyond the image itself. Llenog is clearly an important location, as it is one of only two settlements/ fortifications that are illustrated (beyond a hut shape). 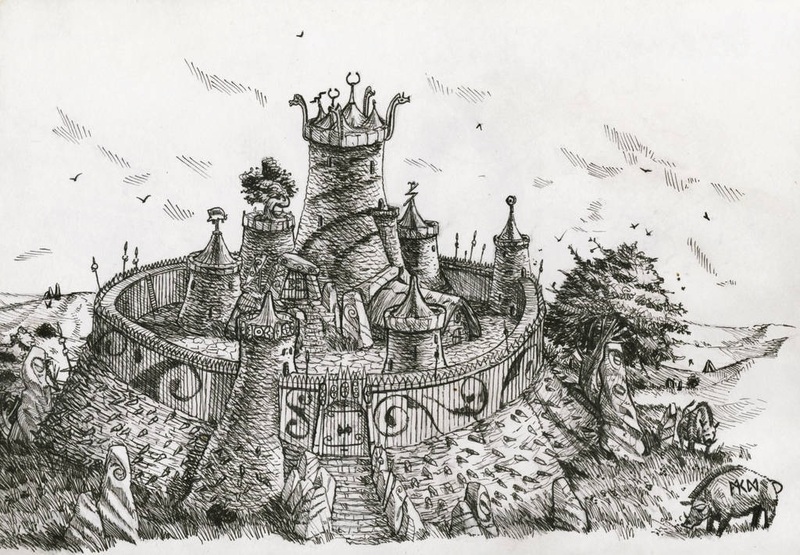 Though the tribes of Albion are deeply divided, The Belenii of The Tower of Llenog are its most powerful and the fortifications are the island's most impressive. The spire of the main hold strikes prominently into the sky, and can be seen well for miles, which is saying much as the island is often shrouded in fog. If ever a capital were to be needed for an alliance it would be here. The chief is proud and perhaps worthy of it, as she commands Albion's largest army, and greatest settlement. She bears the huge and incendiary Spear of the Heavens into battle, a sign of favour from the gods of the sky and fire. Aboard a near unstoppable bronze chariot (worry not, this all will appear) that casts its enemies aside like wake on the waters surface. 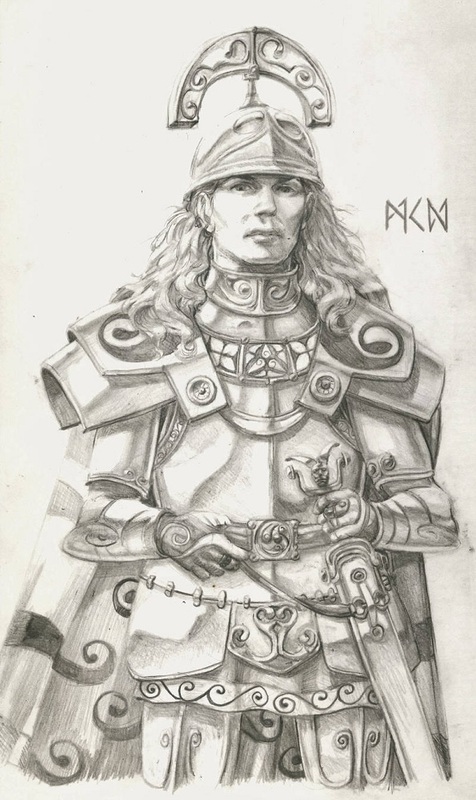 Wait.. is Matthew a member of Druchii? @Imrillion: No, de Witte is not registered here. I'm just acting Ratatosk and relaying matters of interest to the WHFB community. He's well aware. A small fortification for a minor chieftain. The structures are based on "brochs". I capped the thatched spires with some La Tene, and Pictish symbols. Thureos, and Carnyxes to adorn the ramparts. Dark Emissaries are naturally deceitful creatures, and as mercenaries: manipulating their hires into aiding their own machinations. None are more dastardly and Skaven-like than Tornoash, who betrayed even his own master (the daemon Be'lakor) for favour with Tzeentch. Even now he serves no-one, aside occasionally (though with no small amount of spurring) the forces of Chaos. He is more fond of wandering and collecting trinkets from the world, and of foes he has bested, all which aid him in gaining power. A head and hand of a powerful Dark Elf sorcerer who underestimated his foe, which remain animated and tied to his waist so that he may mock it, or ask for advice (by force). A skull of a Bray-Shaman. The Black Stone of Orounnos. The Dagger of Gelenth. And a gift from Tzeentch, a staff which has been ensouled with a Lord of Change that fell afoul of its master and was trapped within. He also has a bag of disgusting treats for the road, mostly live invertebrates. 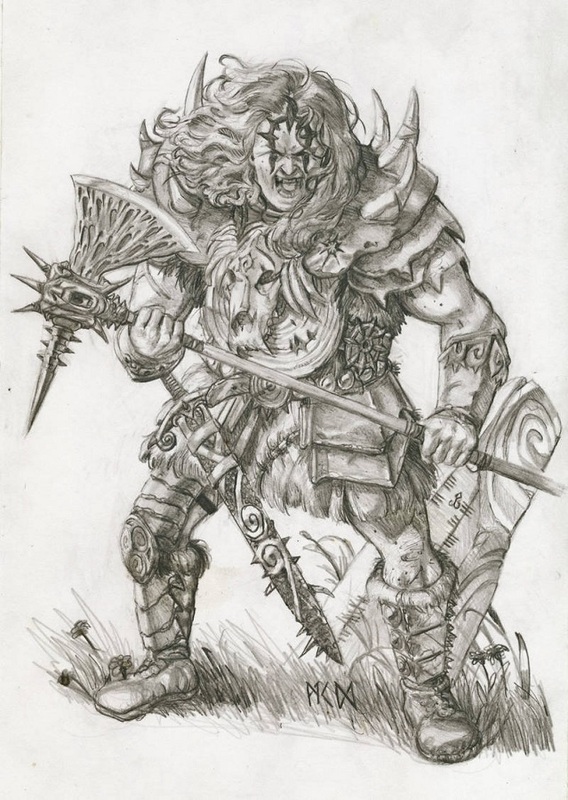 A hulking Norscan warrior with a thick red mane. Her lot has soured in Norsca and has been exiled to Albion, here she tries her luck again. With the mighty axe: "Blodscreamer" in hand she wrests a foothold in the North for her new tribe, contesting the natives, Chaos and Order alike. She is the head of a new invasion. Will she be ousted by a newcomer? Or will Ternoash challenge her might? 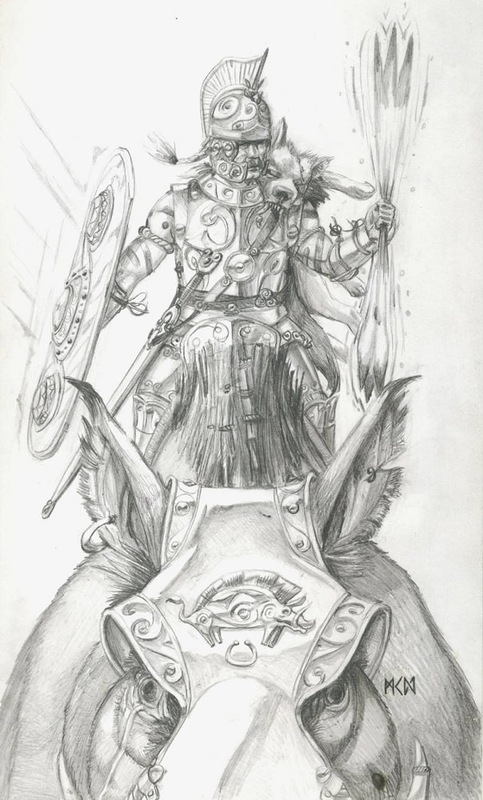 Norsca is very close to Albion on the map so I decided it would be cool to have a Hero who is an outsider, either aiding or challenging the local forces of Chaos. I'm also considering disregarding the Dark Shadows campaign and its results from back in 2001 in my worldbuilding (thoughts?). believability when it comes to female characters? Atop the Pillar is the seat of Draoiorix (whichever form it decides to assume), the great dolmen channels the winds of magic on a far greater level than any other. From here the Truthsayers hold council, and decide the fate of the people of Albion: political disputes, interpreting religion, and law, but only things of import. Wreathed around the clearing are gigantic trees. To the Truthsayers, the Lore of Life is the most important of all magical disciplines. And so, trees grow to mighty heights in an adept's presence. Nice work and a skill I wish I could master. If I might make one observation though. It might just be my old eyes but the hands seem a little small in several of the pictures?